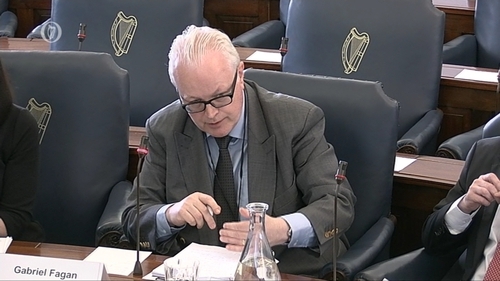 The Central Bank's Chief Economist has told an Oireachtas committee that Ireland stands out as the EU economy likely to be most affected by Brexit. Gabriel Fagan told the Special Select Committee on the Withdrawal of the United Kingdom from the European Union that Ireland was more reliant on UK export markets that any other EU country. He added that certain sectors - agri-food; materials manufacturing and tourism - rely more upon UK markets than others. Mr Fagan said the overall impact of Brexit of the Irish economy is uncertain, and depends on the nature of any new trade agreement. In the event of a hard Brexit with no UK-EU trade agreement, Mr Fagan said GDP would fall by 3%. He also warned that a hard Brexit may also require sudden regulatory and financial adjustments, since UK financial firms would lose passporting rights. "This is likely to be accompanied by a period of heightened uncertainty in the financial services sector," Mr Fagan said. Although he said there appeared to be a middle course between a soft and hard Brexit, the analysis was that the overall economic effects for Ireland in both the short term and longer term will be negative. Mr Fagan said weaker UK and Irish growth would negatively affect those banks which have significant UK exposures. "The weaker sterling exchange rate will reduce the value of profits and assets denominated in sterling," he said. He added that Brexit would present new opportunities for the Irish economy with increased foreign direct investment and new businesses in the financial sector. However, the committee was also told that the Central Bank did not have a role in attracting financial firms to Ireland as this would compromise their regulatory function.